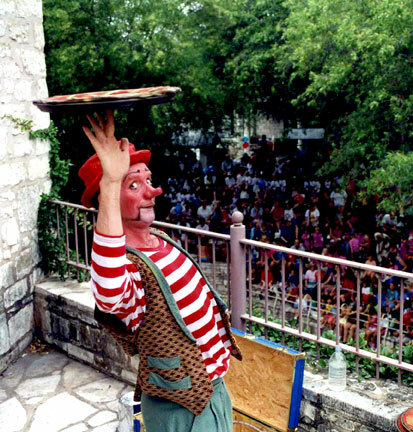 Bonzo Crunch is a former Ringling Brothers Circus clown now residing in Austin, TX. Services provided include clowning, juggling, magic, rope spinning, balloon twisting, face painting, roving entertainment, music (ukulele and harmonica) and more. Appropriate venues include school shows, library programs, pre-school and day care, after care, summer camps, corporate events, birthday parties, family reunions and picnics, as well as all sorts of private functions. 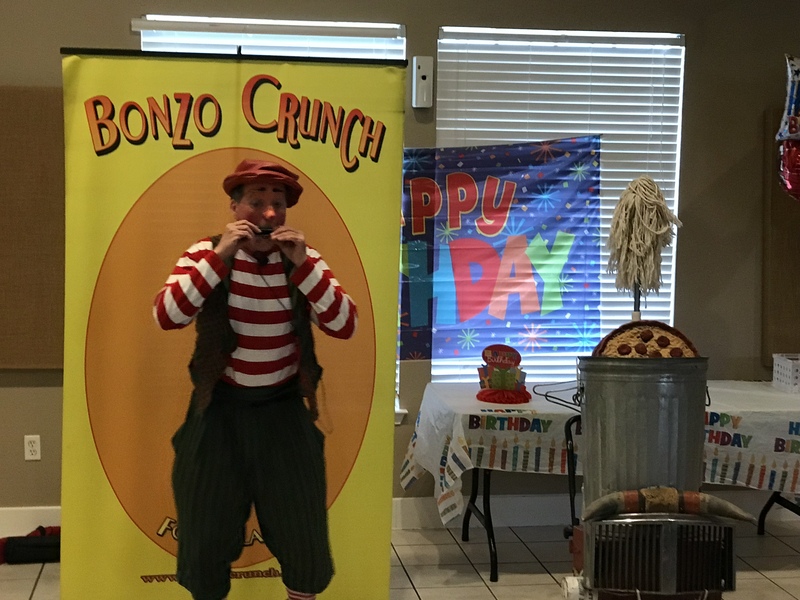 Recently voted "favorite kids entertainer" by the readers of Austin Family Magazine, Bonzo Crunch has been a favorite entertainer in Central Texas for over a decade. Bonzo was great! He had the children entertained and the balloon sculptures were sooo cool! Bonzo was great! From booking, to discussing the event, to performing. He was responsive, flexible, and held the kids' attention (even the 10-11 year old's!). Great show! Thank you, Maria! You all are doing great things with those kids. Blue & Gold dinners are always a lot of fun!!! Bonzo was very professional, committed and really loves what he does! This was evident from his calls to confirm being on time and his magical entry! He also did lot of Balloon Twisting as a freebie! His show was liked by kids, parents and all age groups!! He was excited to see kids enjoying the show and on his own actually stayed more time! Greatly recommended!!!! I enjoyed the show very much as did all the children. The parents told me they liked it as well and said that it was a brilliant idea for me to hire a clown for the kids party. Bonzo was funny and entertaining. He even was patient enough to wait for my whole party to arrive so no one would miss too much of the show. Thanks Bonzo!! Thank you Karen! The children and adults alike were a delight. I think I had as much fun as your guests! Hilarious, prompt, professional, talented, reasonable rates, great props and material, relates very well to the kids, all ages loved the show! 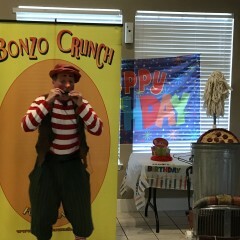 Bonzo Crunch fool at large, was AWESOME the kids loved his performance and so did the residents. He was a HUGE success and funny from the time he made it to the community. It was AMAZING!!! Thank you Bonzo Crunch you are a class act. Thanks Nicky! That was fun doing a show and balloons for the children, and then doing a show for the senior residents. I couldn't resist adding balloons for the residents as well! He was at my nieces 1st birthday and now 16 years later I got him for my daughters 1st birthday and is still as wonderful! I really recommend Bonzo if you plan keeping the entertainment for your children's birthdays or any age!! Thank you Denise; it was so nice performing for your family again. Everyone, from the young to the old, was nice. It was a real pleasure and an honor to be a part of your celebration! Thank you Misty. That was a wonderful group of children. I've never had my face on a birthday cake before--that was a treat! Insurance: $3,000,000 - Performers of the U.S.
Bonzo Crunch: Fool at Large, also known as Rik Gern, has been performing as a clown since 1978. Inspired by the classic slapstick comedians of the ‘20’s and ‘30’s, Rik began his training at the Dell ‘Arte School of Mime and Comedy, and later graduated from the Ringling Brothers Barnum and Bailey Clown College. As Bonzo Crunch, Rik has performed from the streets of Sydney, Australia, to cities all across the United States and Canada; in venues ranging from A Taste of Chicago to the Texas Governor’s mansion. Rik has performed on his own, and as a clown in the Ringling Brothers circus, and later as their advance clown, or “Goodwill Ambassador”. His performances are family friendly and suitable for all ages. 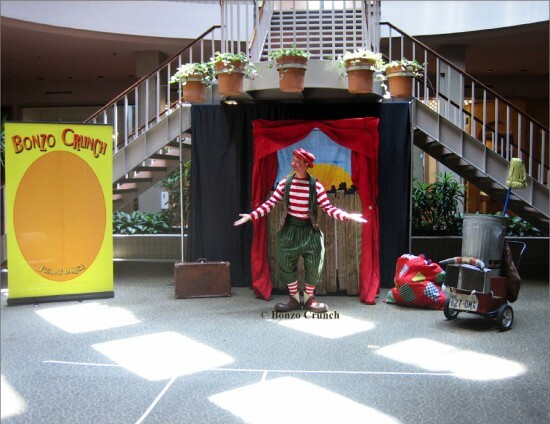 He offers a comic juggling and magic show suitable for anything from assembly programs and banquets to picnics and birthday parties, as well as roving entertainment, meet and greet, lasso, ukulele, balloon sculpture, face painting and more. Performances range from 30 minutes to an hour or longer, and can accommodate a stage setting as well as more informal "roving" situations. 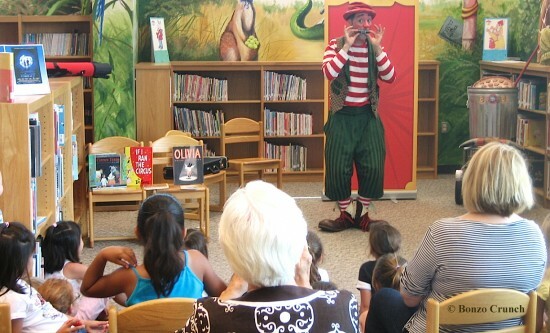 In addition to a vaudeville style comic juggling and magic show, educational programs such as a reading show, a fitness program and/or workshops are available. Having performed in venues ranging from the intimacy of hospital visits, senior centers and birthday parties in the living room to large venues such as basketball games and circus arenas, and everything in between, including school assemblies and pep rallies, Bonzo Crunch is comfortable with large crowds as well as small groups. His makeup was designed to be expressive from a distance, but non-threatening in a close-up context. He possesses patience and gentleness that make him suitable for young children, as well as a level of skill and wit that make him appropriate for older children and adults. Rik currently lives in Austin, TX where he has been voted “Favorite Kid’s Entertainer 2012” by the readers of Austin Family magazine. Rik/Bonzo continues an active schedule of clowning, and uses his spare time to improve his craft. Mostly self contained, but may need small table and chair for reading program or face painting.